20% Cashback is valid from 20 July, 12.00 AM to 23 July, 11.59 PM (both dates inclusive). 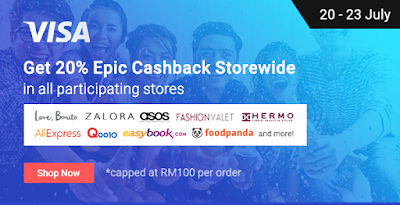 All 20% Cashback is capped at RM100 per order. 20% Cashback is not applicable to Grab, HungryGoWhere and Eatigo. Valid only for checkouts with Visa through the promotion page at https://www.shopback.my/visa. ShopBack reserves the right to deny Cashback to purchases not made with Visa cards. ShopBack reserves the right to modify, amend or discontinue any part(s) of this promotion without prior notice. Make sure your cart is empty before clicking through ShopBack. Enter the first 6 digits of your Visa credit or debit card to access this page. Click through this campaign page to the merchant site. Check out as usual with Visa card within the same session.